GE Intelligent Platforms introduces a new range of high speed data transfer modules designed for high speed data transfers and remote data gathering. The SPR507B 4-channel serial FPDP interface PMC/XMC modules are designed for high speed remote data transfer at industry-leading rates, especially in applications where input from multiple sensors needs to be gathered for back-end processing. The modules allow valuable chassis slots to be saved, resulting in smaller and lighter solutions. 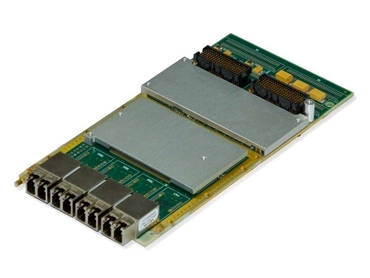 Available as PMC modules for legacy systems or as XMC modules for more recent systems, the SPR507B uses a Xilinx Virtex-6 FPGA to help it deliver up to 4.25 Gbaud per link, or a total bandwidth across its four ports of around 1.4 Gigabytes/second. GE’s expertise in thermal management and ruggedization has been incorporated in the new data transfer modules, allowing them to be more easily deployed in confined space applications where the environment is subject to extremes of heat, shock and vibration. The low latency protocol used in serial FPDP and the noise immunity of the fibre-based data transport make the ideal combination for applications that require a dedicated data link to run between sources of data, such as a high speed digitizer to a remote data processing station. The SPR507B allows for fibre lengths up to 10km in length with a choice of single mode fibre. According to Dan Veenstra, Product Manager, GE Intelligent Platforms, the SPR507B delivers a 30% faster transfer rate than the industry standard, making it a compelling option for customers seeking speed. In addition to industry-leading performance, the SPR507B data transfer modules also deliver advantages such as flexibility, ease of use and SWaP characteristics.